How do I use Second Life with the Oculus Rift? 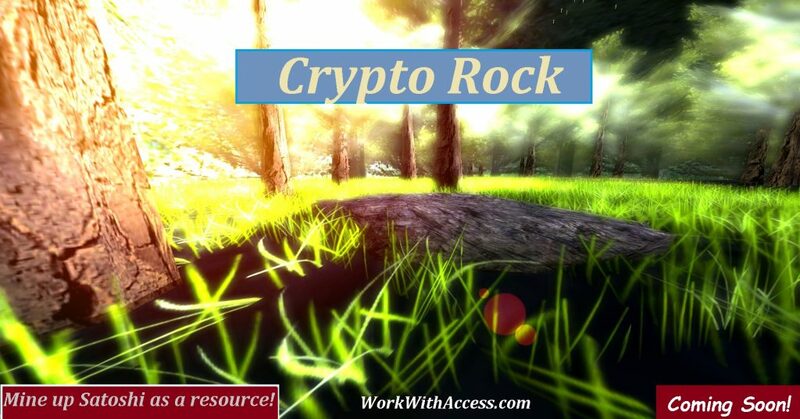 It is a work simulation VRMMORPG with a real cash free market economy where players can mine up resources and lindens by picking rocks, chopping trees, smelting, crafting, trading, and more. The concept of the work simulation goes much deeper then most realize at first, because at it’s core is a Second Life land traffic/ad system. The land owners/rock owners aren’t just the purchasers of land traffic, they are part of the simulations ecosystem and can use the Land Owner point system to access unique rare tools to sell to visitors or use themselves. The skills and stats they gain increase resource production thus producing more craft-able tools to sell or trade to other participants or use themselves. 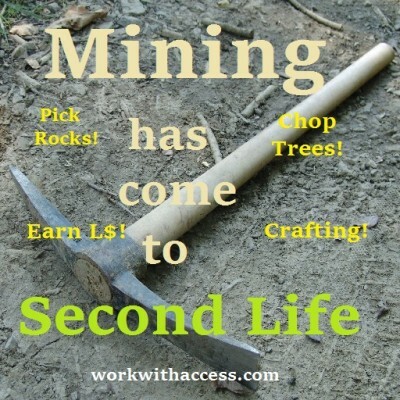 Do I need to signup to workwithaccess.com to play the SL Mining VRMMORPG? No, but it is needed to use the forums and to play the web-game. The web-game is currently under construction and being revamped to work better along with the Mining simulation. I’m new to the mining simulation, is there any way for me to start or learn what to do without reading this entire FAQ??? It is recommended that you first join the Mining Simulation Group within Second Life and talk to other players, find a mentor, or even take on a job for another. There is much complexity and many different areas of profession available to you, so a good mentor can help guide you in the direction/area your wanting to get into. Experience and agility both effect your yields, (each profession has its own Exp Stats), and agility effects all physical professions. So you could work as a lumberjack and build agility while skilling your Lumberjack Exp, this gain in agility will effect all professions even if you haven’t skilled them yet! Health is your level of life or HP that you have, when your health goes below 1 you die and cannot use most tools. Most low level tools only use a tiny fraction of health. You can gain health in tiny amounts free by warming by fires, napping, or sleeping in Rest and Sleeping areas. Eating and drinking is fastest and most efficient way of gaining Health. How do I increase my Health?? You can gain health by drinking Water or Milk. drinking water gives 1 health and milk gives 5 health. More drink types and foods coming soon! You can gain health in tiny amounts free by warming by fires, napping, or sleeping in Rest and Sleeping areas. Eating and drinking is fastest and most efficient way of gaining Health. What are Optimal Agility Skill gains?? Each Pick-type now has its own optimal skilling range in Agility. When your Agility is within a tool’s optimal Agility range your Agility skill gains are optimally increased! Where do I find a Pick axe, Tree axe and Miner’s hat? At the front desk in the lobby of the Access Business Center. How do I use a Pick axe? Just attach the pick axe to your right hand, stand in front of rocks in the area, and click the pick axe to start swinging! All messages about what you are getting in yield and skills can be seen by you in local chat. Just attach the tree axe to your right hand, stand in front of a tree in the area, and click your tree axe to start swinging! You must click on your tool and not the tree! Clicking a tree or its branches will give a “Sorry, you don’t have permission to use this tree.” message. Sitting or getting a better camera angle can help from clicking trees or their branches. All messages about what you are getting in yield and skills can be seen by you in local chat. Can I use more then one Tree axe/Pick axe/Tool at once? No, and attempting to use more then one pick axe or/and tree axe at once will result in both or all tools attached to be locked and unusable. So be very careful and always detach picks/axes before adding a new one!!! Chainsaws are a specialized tool for Lumberjacks. Unlike most tools the chainsaw gives no skills, it multiplies the wood production you would normally get at your current skill levels by 2.3X. Each use of a chainsaw takes 0.25 health and cannot be used when your health falls below 1 health. Tree sap would have to be the easiest material for a new player with no to low skills to produce. There is a boost to tree sap production for new players till they reach 10 Agility, then the production bonus ends and tree sap production is based on your skills and stats. There will be other periods of production boosts throughout the Lumberjack profession. Skilled lumberjacks will pass the point of production efficiency of the new player production boost of tree sap. How do I mine at the Salt Rock mines? Talk to Farmer Greenjeans outside HQ by the corn fields, He’ll tell you how to get a Salt Rock Hammer. Hammers are also buyable from other players as well as the materials to make them. How do I sell my salt? Talk to Salty Sal by the Salt Mines, He’ll help get it in a Salt Shaker, but you’ll need Shaker parts! Use the Tiny Tree Axe on a Tree to find Tree Sap! How do I milk the cow?? To successfully milk the cow you must have at least 1kg of leaves to feed it. The Handsaw is a lumberjack tool that is used to collect wood, leaves, and twigs. How do I find Water?? Water can be gathered by using a normal tree axe. Praying is a free activity open to all players, and lets you build Inspiration! You can Pray inside the Church at HQ. Inspiration is used to complete certain tasks but its main influence is gaining Focus! It takes at least 5 points of Inspiration to gain Focus. What does Being Focused do?? When your avatar is Focused you stay Focused until triggered. When it comes to Mining and Lumber-jacking a Focus can be triggered randomly and used giving you a 20% yield increase and also a Bonus boost using some tools in those fields. Once your focus has been triggered/used, you lose your Focus, so only Focus yourself when your ready for it to be used. How do I focus my avatar??? You use the Focus Ring available in the HQ lobby to initiate a Focus, but the Ring will only gain you Focus if you have 5 or more points of Inspiration! How do I Inspire someone else with the inspiration I’ve gained??? Once you get 25 or more Inspiration you can Transfer the Inspiration to an Item that holds the Inspiration so you can give/sell the Inspiration to other players so they can be inspired! You do this by using the Power Transfer laptop in the lobby area. It takes one Power Orb per Inspiration transfer. Power Orbs are used to manually boost output of the Power-grid to power Items and Crafting Machine activities that require more power then the current Power-grid conditions can provide. How do I feed the Chickens?? To feed a Chicken you must have at least 1Kg of Chicken Feed and your avatar must be Focused! If successful the Chicken will lay a fresh Egg for you! How do I make Chicken Feed?? You can use the Blender in the HQ Kitchen area to blend Raw Corn and Corn Stalks into Chicken Feed, a Power Orb may be required to power up the Blender! What can I do with Raw Eggs??? You can fry them on a Stove in any Kitchen/Cooking area, but you’ll need some Butter to get the job done! How much Health does eating Fried Eggs give me?? Fried Eggs give you 4 Health per 0.1Kg Bite, so Eating 1Kg of Fried Eggs gives a total of 40 Health!! You can eat your Fried Eggs at any Restaurant or Eating area. What does the Mining Sword do?? The Mining Sword is a specialized mining tool that lets you auto-mine. just stand in front of a rock, click the sword once, and you’ll begin auto-mining. To stop auto-mining, just walk away from the rock. The mining sword uses 0.06 health per swing and cannot be used once you go below 1. How do I farm corn?? You can start the Farming profession by using a Farmer’s Sythe on cornfields. Your yield will be based on your Farming Exp. and Intel Stat. Farming uses a tiny bit of health, so your HP must be above 1 in order to farm. Corn can be taken out of stats in 1kg increments from the freezer in the Kitchen in back of restaurant. You can eat raw corn in increments of 0.1 Kg bites in the restaurant giving 0.8 HP per bite. There is enough seating in the restaurant for up to 16 players to eat together at once. Use 1 Liter of milk in the Butter Churn located in the kitchen. Use the Stove located in the kitchen and click the stove top to begin. You’ll need 1 Kg. of Corn + 0.5 Kg. of Butter to make 1 Kg of Cooked Corn. Cooked Corn can be eaten in the restaurant in 0.1 Kg. bite increments giving 2 Hp per bite. What are the production boosts for each agility range? You get special production yield boosts when finding certain resources/materials with certain tools, heres a list of the currently known boosts, more will be added in near future. How do I get payed Lindens for picking? Every time you mine up lindens while picking rocks you will be paid instantly and directly from the rock’s budget, no ATMs needed. You will also make much more on top of that by selling your resources and crafted picks. There is no limit to how much resource a pick axe can yield, your yield is based on your skills/stats. No, unlike rock picking where you get paid while gathering resources, lumber jacking you only gather resources, this keeps wood and other lumber jacking gathered resources valuable and in demand. So a skilled lumberjack can do very well. Where do I find Rocks, Trees, Mining Areas and Events? You can see all the latest mining locations and events on the Mining Location’s Page. It’s recommended that beginner players mine at Agility Boost events to get over the beginner’s skilling hump. Can I profit on 1x rocks? Only skilled miners can yield enough to profit with base stone pick axe on 1x rocks. The more skilled they are the more they can profit. How do I craft and smelt? The Crafting and Smelting functions can be accessed by using a crafting machine, they are located in the church and in the crafting shack. How do I enter the underground caves area?? There is a mining cart by the church, it will bring you into the caves. You may have to wait a short period for the cart to return. The Research Laboratory is located on a Space Station orbiting the planet. To get there, you need to catch a space flight outside the HQ building or the roof docking area, there are many flights in route, so shouldn’t be a long wait in between flights. There are 2 Research Stations now open in the facility. You must have a minimum of 1Kg Unknown resources to have a successful identification of the material! Clicking on the little blue ball in front of a research station initiates a research cycle. Your intelligence stat determines your Researcher level, after each successful identification you can see what intelligence is needed to unlock the next Researcher level. Intel can also effect high level crafting. Your Research level determines what materials you are able to identify, the higher your Researcher level is, the more materials you are able to identify. What are the Crafting Experience requirements to Craft each Pick Axe type? Steel Pick Axe: 30 Crafting Exp. Diamond Pick Axe: 60 Crafting Exp. Obsidian Pick Axe: 150 Crafting Exp. Silver Pick Axe: 500 Crafting Exp. Gold Pick Axe: 650 Crafting Exp. Researcher Pick Axe: 800 Crafting Exp. Geologist Pick Axe: 1200 Crafting Exp. How do I get my resources out of stats into Bowls? Resources can be taken out of your Stats and into the second life world as an item. You can only take out resources when amount is 1 or more, you cannot take out decimal amounts. To do this click the crafting machine, choose crafting, then choose get resources, and lastly choose the resource you wish to take out. You will then be sent that resource as an item from the crafting machine! Don’t accidentally decline the resource item send! Choose Accept. How do I sell and trade resources and crafted tools? To give someone else a resource you brought into the world from your Stats as an item, just drag and drop the item from your inventory, (usually in objects folder), to the person you wish to give it to. But for less casual and more secure selling, simply teleport to a second life sandbox. There is a sandbox poster in the lobby that brings you to one. A sandbox is a place you can “Rez” your objects. You drag your item to the ground, right-click and edit it, set the items price your asking, and check the box to set the item for sale! The buyer can then teleport to you, buy it, pick it up and its theirs! Be very careful not to click your resource item accidentally while setting it for sale, doing so will send it back to your stats again! A vendor is a player created object that contains tools/items in mass quantities. Since you cant see a Tool/Item’s hover stats inside a vendor, there’s no guarantee of hover stats, so only buy from vendors if you know/trust the vendor owner! You can always check creator of a buy-able tool/bowl/item. If Access Toshi is creator it’s a legit raw tool/food/resource/item and safe to buy. Following these guidelines will keep you selling/buying safe and securely. Remember if your unsure of a vendor, contact owner, they can take out the raw items and sell to you securely detailed in paragraph above this one. How much should I sell my crafted picks for? The only direct buy-able pick axe in the game is the Stone Pick axe, and the rest of the picks are crafted and must be bought from other players or made yourself. Since most crafted picks, including crafted stone picks, have higher stats then the bought stone pick. The price of the Stone Pick in the lobby would be a good indicator for the value of others above it. 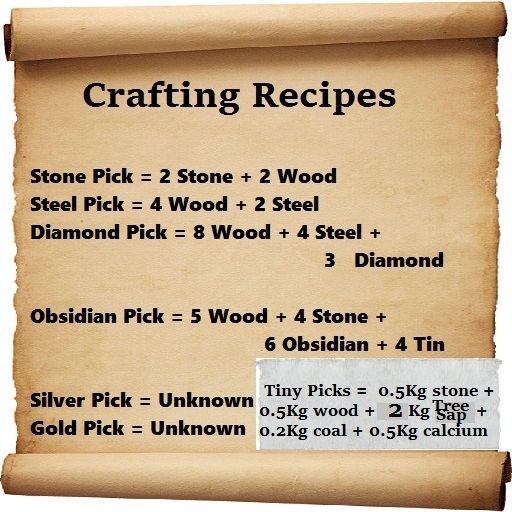 What are some of the crafting recipes for Picks? What do I need to smelt Steel? Where can I find Antimony? Smelting Antimony can be found by mining at Smelters Rock, located in the Enchanted Forest! To get to the Enchanted Forest catch a mining cart by the Church. Mining Cart departures are announced via the group chat. What are the benefits of owning rocks for my land? One obvious benefit is the traffic generated by players picking at your rock. But it goes further then that, every time a player (including rock owner) mines up Lindens from the rock, the owner of the rock gains agility. The more players that mine up Lindens from the rock, the more Agility the rock owner will gain. So rock owners can gain agility without even picking or being online! This agility directly increases your mining yields in real time, thus making it easier and cheaper over time to craft tools to either use to skill more or to sell to your land visitors to use. This drastically offsets your traffic costs to no end. There is no limit to how skilled you can become! Does a 3X Rock give its owner more agility than a 2x Rock? Absolutely! A 3X Rock gives its owner double the agility and more LO Points then a 2X every time someone mines up Lindens from it! 4x rocks give 4 LO Points and rare resource benefits setting them apart from the 2x and 3x Rocks. How do I get rocks for my land? To become a Rock Owner you must have a good understanding of the simulation, be at least 25 Agility, and then apply for a Rock via the Mining Simulation High Council. When accepted you will be setup with rocks and Trees for your land, and link its SLURL to our Mining Locations page. What are “Bills” and what do they do?? More additions to this FAQ coming all the time!